Let’s Talk Emotions is a book by Dr. Teresa A. Cardon, a Behavior Analyst and Speech Pathologist from the United States working with individuals on the autism spectrum. This book was created for parents, teachers, and other adults to help children on the autism spectrum and also children who may be dealing with other social cognitive difficulties. The book provides activities and worksheets for children between the ages of 4 to 18 to help them recognize, understand, process, and respond to their own emotions and the emotions of others in positive, empathic ways. 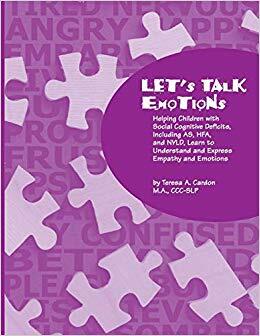 The book can help reduce frustration in children who may struggle with understanding emotions, and help them build positive social relationships.